Climbing and descending through the most beautiful, impressive dunes will be an unforgettable experience for travelers coming to the Oregon Coast. This one hour tour covers eight miles of dunes and two miles of ocean beach. All ages are allowed on this tour. Pregnant women are allowed if not under any doctor’s restrictions. Reservations are recommended - Be sure to make reservations if you have a limited amount of time in Florence. No minimum age. Car seats recommended for children under two or unable to sit up well. Please bring your own car seat. Recommend hooded coat or sweatshirt. Dress warmly! Very cold! Weather conditions change quickly! 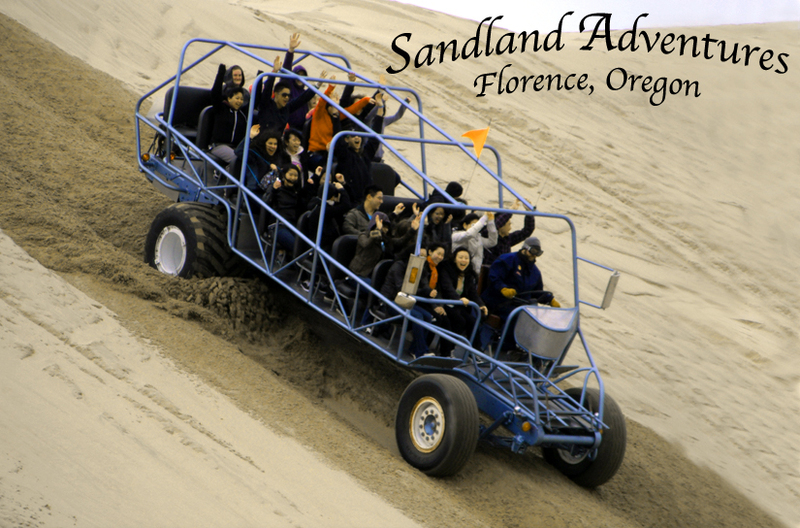 Giant Dune Buggy tours are not for people with vertebrae issues or health concerns. Pregnant women are allowed to take the Giant Buggy tour if not under doctor’s restrictions. DRESS WARMLY ON TOURS. We run our tours rain or shine so come prepared for the weather! A hooded coat or sweatshirt, long pants and closed toed shoes are recommended. Our average temperatures with wind chill can be as low as 50 degrees. The forecast is unreliable. Car keys, wallets, cell phones and valuables should be secured in a zippered pocket. We are not responsible for lost items. Great photo opportunities but protect your camera from blowing sand. There is always a chance you will get sand in your camera, even if you’re careful. Allow plenty of drive time for road construction, bridge work and 35 mph traffic. You may miss your tour if your late. No Refunds. All tours cancelled outside of 48 hours from the date of the tour will be refunded in full, less a 7% cancellation charge. No refunds or rescheduling tours within 48 hours of departure. Reduction in the number of passengers can be made more than 48 hours from tour departure. You would be charged a 7% cancellation fee and refunded the balance. Late arrivals missing their tour departure can not be transferred to a later time or different day. Memorial weekend thru Labor Day weekend - 7 Days a week - Open 9 a.m. – 5 p.m. with extended summer hours. Sunday and Monday in March, April, May (except Memorial weekend), October, November and December.